I read this article and found it very interesting, thought it might be something for you. 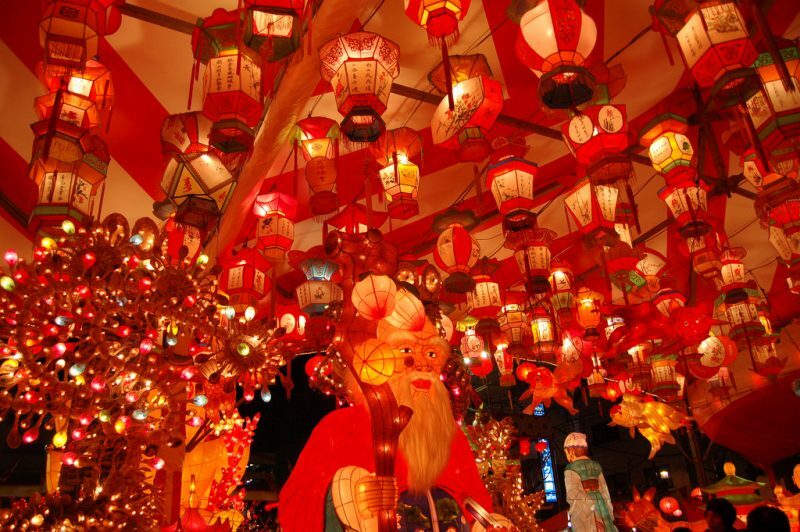 The article is called 30 Things To Do in Nagasaki and is located at http://trip-n-travel.com/listicle/14970/. The Nagasaki atomic bomb museum, located in Nagasaki, was built as a remembrance of the people who died in Nagasaki bomb attacks. The bombings marked a new era in war and this place is a symbolic remembrance of that event. The museum has quite a peaceful atmosphere. 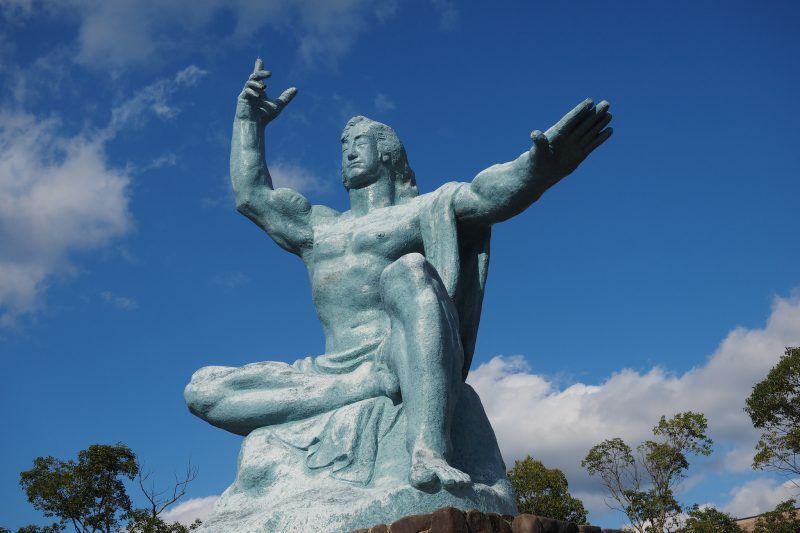 It gives a message that the people of Nagasaki have rebuilt themselves. The museum is a bit small but has a powerful effect. Plus, it is close to the train station. So visit this museum. Opening hour: 8:30 a.m. to 5:00 p.m. The Peace Park in Nagasaki was another park built in honor of the dead in Nagasaki bomb attacks. It is present next to Nagasaki atomic bomb museum. There are peace and tranquility in the park. The most famous statue there is a peace statue which depicts a man with one hand raised towards the sky and the other one pointing towards the ground. Many other memorials are also present in the park. Opening hour: 8:30 a.m. to 5:30 a.m. 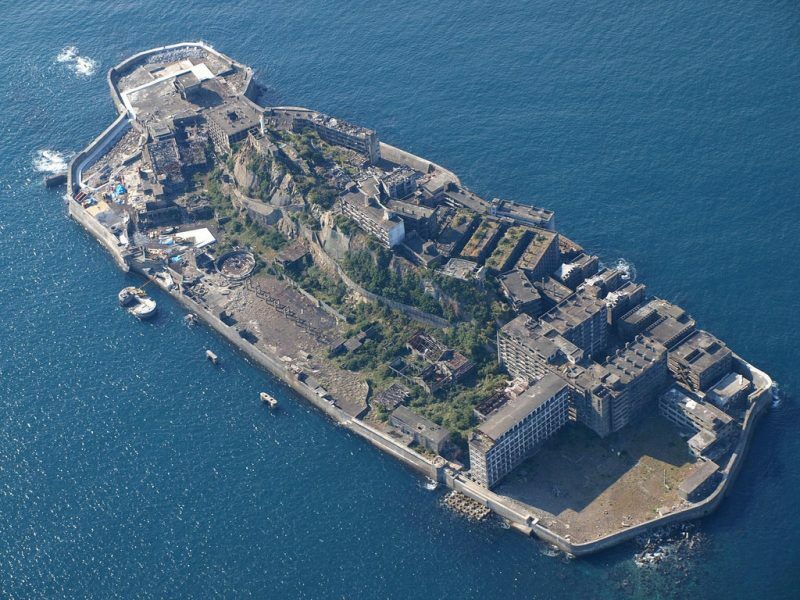 The Hashima Island lies 15 kilometers from the city of Nagasaki in southern Japan. However, it is just one of the 500 abandoned Islands in Nagasaki. The place is quite interesting itself. If the weather is nice, you can walk along the sea and discover new places on the Island. The tourists guides are also quite helpful and give you a detailed view of the area. The trip costs about 4,000 yen but still, it is quite worth it. Opening hour: 9:00 a.m. to 5:00 p.m. 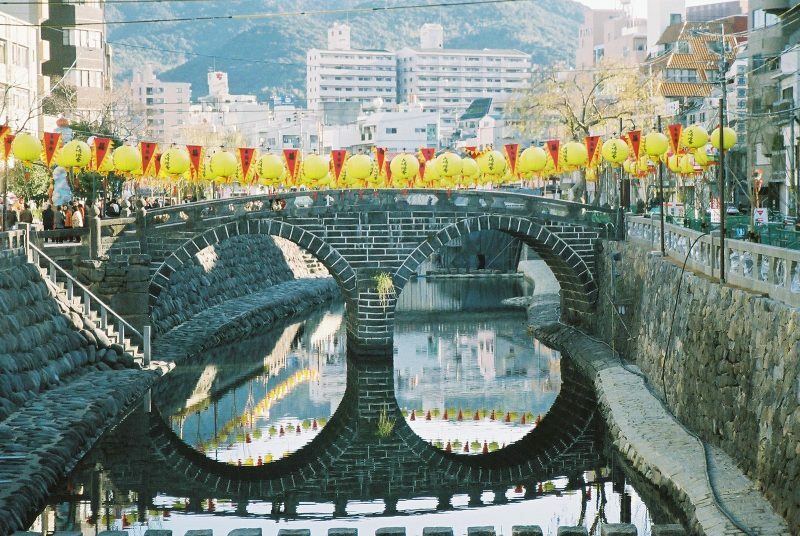 The Spectacles Bridge was built in Nagasaki way back in 1634 by a popular Japanese monk. It is one of the oldest arch bridge in Japan and it is given this name because its reflection looks like spectacles. The bridge is quite beautiful and a spectacle. It is a super beautiful scenery and you can walk along the bridge. You can even take pictures there. The place is just a short walk from the tram stop. So you should visit it. Glover Garden is a park in Nagasaki which was originally attributed to Thomas Blake Glover, who contribution to the modernization of Japan. It is an interesting place to visit and tells you about the history of Nagasaki. You can also make coffee if you are a coffee fan. You should visit the place on a Sunny day because the views are just breathtaking. Sky elevators are present there to take you to different places. Opening hour: 8:00 a.m. to 6:00 p.m.
Dejima is a man-made island on the port of Dejima, which was originally constructed in 1636. But today, the place can’t be classified as an island because many areas have been reconstructed, like warehouses, residences, walls and gates. The island is really an interesting place to visit with your friends and family. You will see tons of inspiring things. You can also experience the cable car which is available to the visitors. The Oura Catholic Church was built in 1864 for the merchants who took their residence in place after the Japan’s era of seclusion. The church itself is quite beautiful from the outside and you will definitely appreciate the artistic work done on it. However, it is a bit small from the inside but it still is beautiful. If you aren’t a lover of the church, you shouldn’t go there because you just have to sit there and look at everything for some time. The Nagasaki China Town is probably the Japan’s oldest China Town, constructed in the 17th century. The residents of China Town live as if they are from China and they bestow such colors to the town which aren’t to be seen anywhere else. There are several Chinese restaurants and shops selling Chinese goods at a reasonable price. Although it is smaller as compared to other China towns, still, it is worth a stop. Opening hour: 11:00 a.m. to 9:00 p.m. The Inasayama Observation Deck is a must-see place. 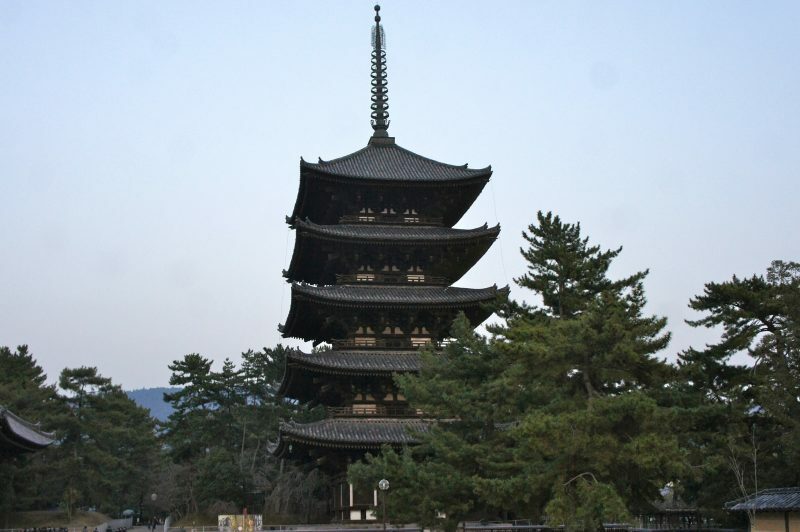 It is situated on Mount Inasayama which is about 633 meters high. You can visit the deck during day or night but the best time is probably the night as you can see the lightings in the city of Nagasaki. There are some nice Japanese food restaurants around the place where you can grab a bite. Spend about 40 to 45 minutes at the top and take photos of Nagasaki city. The place is just a short walk from the nearby station. Opening hour: 8:00 a.m. to 8:00 p.m. 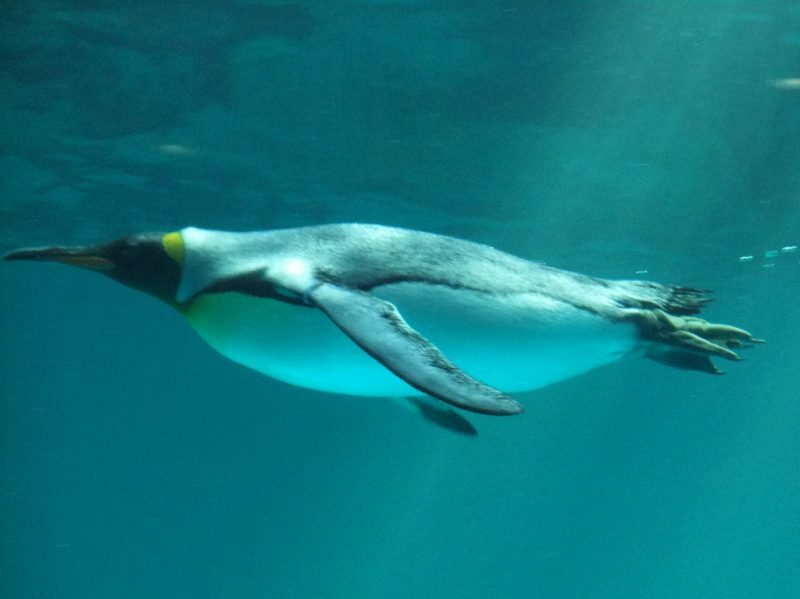 The penguin Aquarium is really a beautiful place with eight different species of penguin. The penguin was made to show the children about the harmony between human and nature. The place isn’t that much big and it will only take about 30 to 40 minutes to tour the whole place. The penguins there are quite happy. Bring children along with it; they will love seeing and touching the penguins. 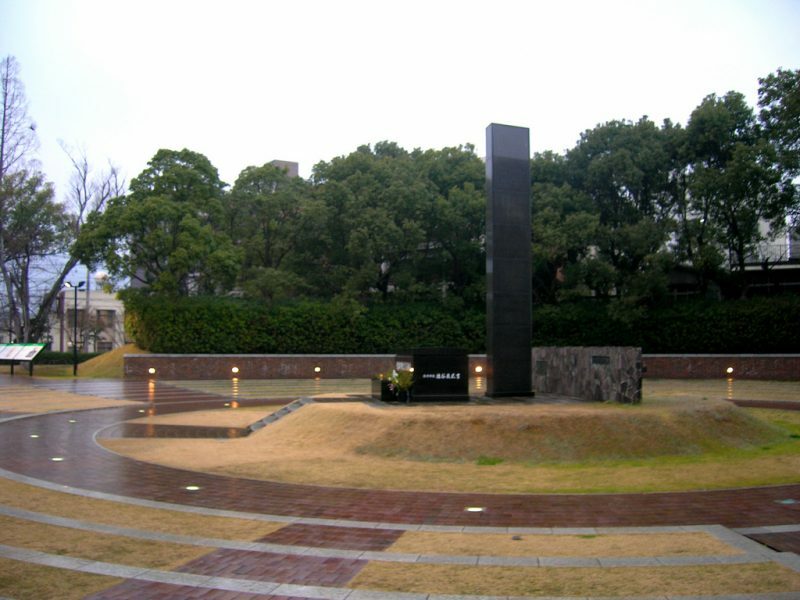 The Atomic Bomb hypocenter depicts the exact point of the atomic and the destructive force it was hit. It is also known as ground zero. This place is marked in the center of concentric circles. The monument is built in honor of those who were never found. It is and always be a place of sorrow. However, you can also enjoy at the park with friends and family. Opening hour: 8:30 a.m. to 6:30 p.m. The Suwa shrine, located in Nagasaki, is a major Shinto shrine of Nagasaki and a place for many festivals. The shrine was originally constructed to stop the people’s conversion to Christianity. As you enter the shrine, you will find out that it is quite big. You can walk freely in the shrine, however, there are a few off-limit areas. You also get a beautiful view of Nagasaki from the temple. 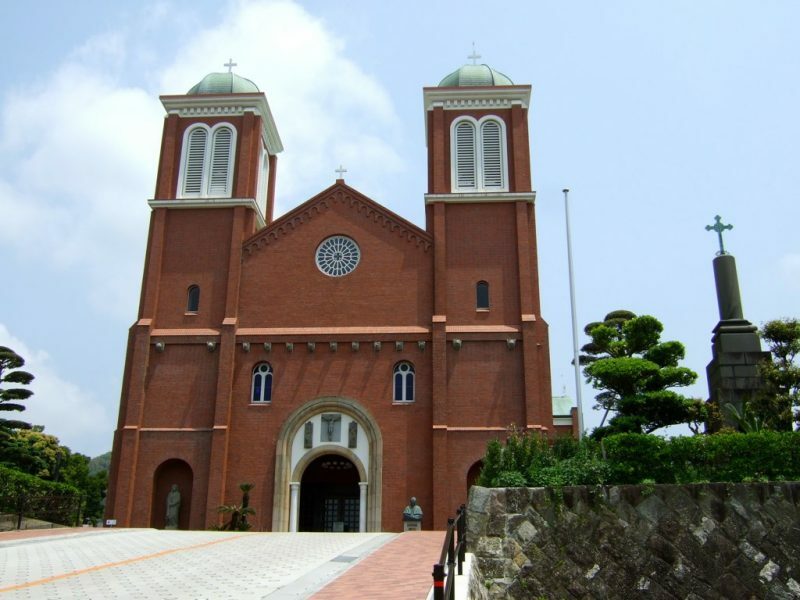 The Memorial Martyr is a place built in order to honor a group of Roman Catholics who were crucified on Feb 1597 in Nagasaki. These 26 people had been arrested and killed on the ground that they were preaching Christianity. The memorial museum does justice to these people as it looks just splendid from far away and it doesn’t disappoint you on close examination. The memorial is just a 10 minute walk from the station. So, you should visit it. This museum was originally designed by Kuma Kengo and stands in an environmentally friendly place. 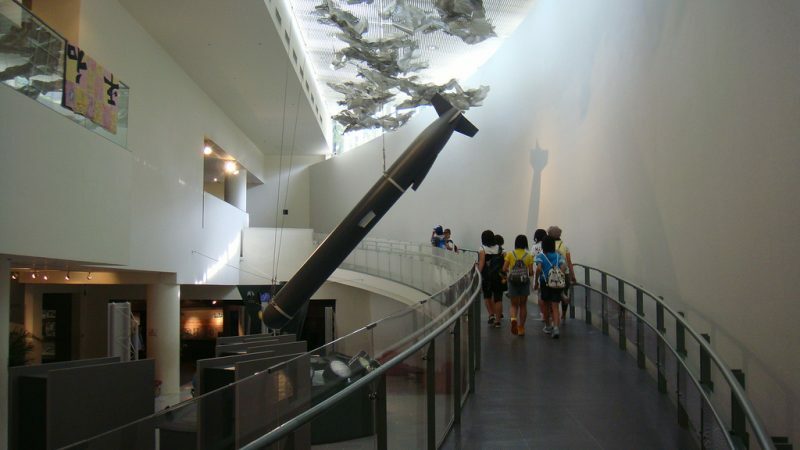 There are both Nagasaki and Spanish arts and some special exhibits. You can come here if you have some time to kill. You will be charged 400 yen to look at the art, otherwise, it’s free. The collections of Pablo and Picasso are also kept here. There is a lovely café up close where you can freely drink. Opening hour: 10:00 a.m. to 8:00 p.m.
Don’t miss to view the Nagasaki peace statue on your visit to Nagasaki. The statue was built in 1955 by a locally born sculptor to stop the recurrence of this event again. The statue is quite beautiful in itself. It is located in Nagasaki Peace Park. 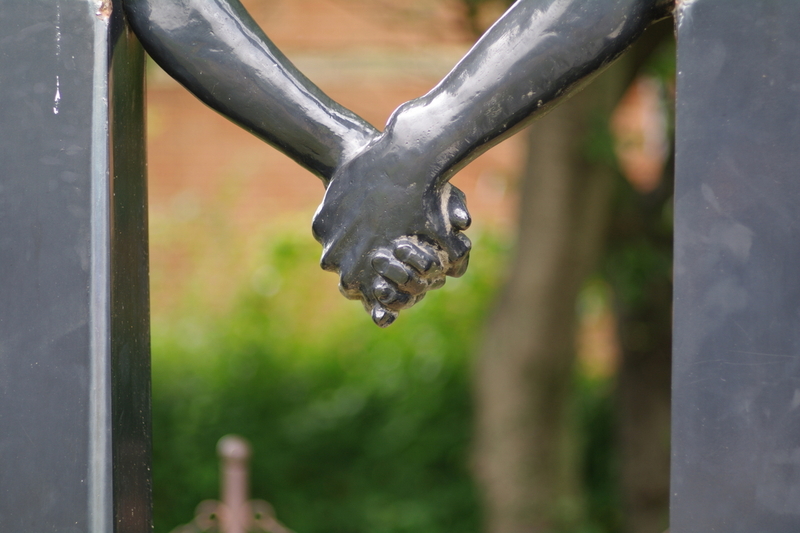 The statue’s right-hand points towards the threat of nuclear weapons while the right-hand points towards eternal peace. You will be amazed to see the statue and the names of the people who died, engraved on it. 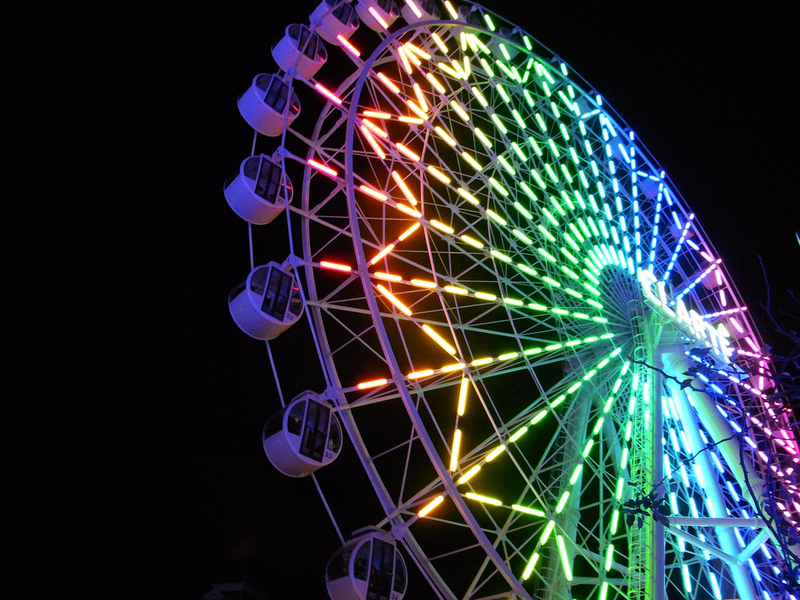 If you are stressed out, why not take a breather at Nagasaki seaside park located in between Matsugae International terminal and Dejima Wharf. It is quite a peaceful place where you can enjoy the fresh breeze and the view of canals. You can come here for almost everything, from playing to walking to exercising to walking your dog. The view of the sea is quite brilliant. So bring a coffee and enjoy the quietness. The Urakami Cathedral was originally built in 1925 and was the biggest church in Asia. However, fate intertwined and the biggest castle in Asia was completely destroyed by the atomic bomb attacks on Nagasaki. When you will visit the church these days, you will see the headless statues of the saints and the broken bell tower. The church is just a 10 to 15 minute walk from Nagasaki station. So you should visit this place. 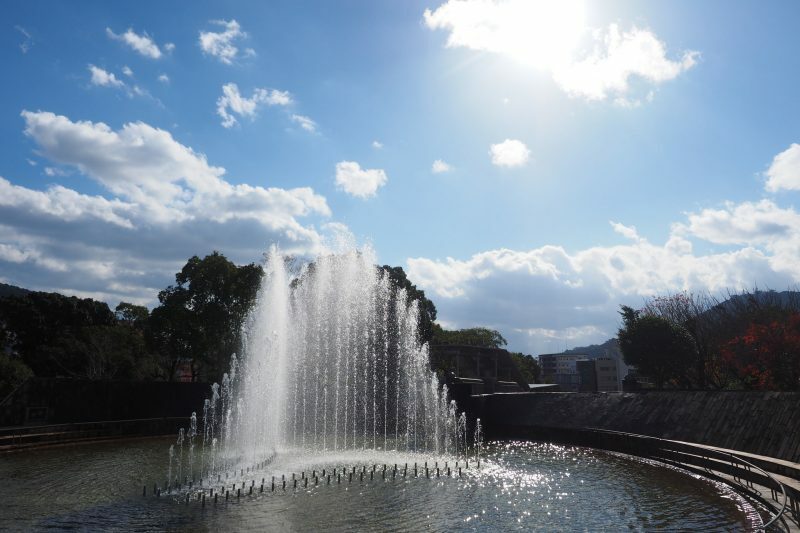 The fountain of peace, located in Nagasaki Peace Park, was built in order to honor those who died searching for water. The Nagasaki citizens who hoped for eternal peace after the nuclear attacks gave money for this fountain in 1969. It isn’t like any other fountain. This fountain is in conjunction with lasting world peace. The statements engraved on the monuments are also quite impressive. The place is nearby Nagasaki station. So visit it. The Shinabama Peninsula is a popular site and hiking destination located in the east of Nagasaki city. The peninsula is located close to the Mount Unzen at its center and therefore, it has been the victim of many volcanic eruptions, including the eruptions of the 1990s. 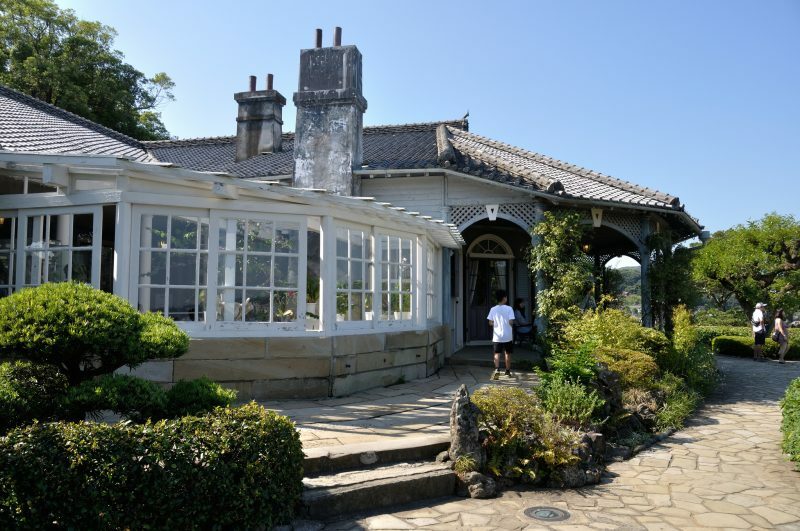 The Peninsula is certainly a worth-visiting site and there are many beautiful spots to see there like Mount Unzen, Shimabara castle, and Hara Castle ruins. The castles are wonderful and quite and the museums tell you about the long history of the place. Opening hour: 9:00 a.m. to 11:00 p.m.
Iojima Islands is a beautiful place to visit if you want to leave the hustle and bustle of Nagasaki city behind you for a while. The island seems a bit too faded away but not in an unpleasant way. You can reach there by a boat. The first thing you will notice as you step foot in the island is the quietness as if someone has abandoned the place. However, there is plenty of free space and you can take long walks to the beaches and enjoy the weather. Yossou is quite a traditional restaurant in Nagasaki, where the visitors are required to take off their shoes and wear indoor slippers. You would then be escorted into the dining room where you would be able to choose between Western-style tables and Japanese-style tables. The food portion is quite good and if you have the same amount of food in Europe or America, you would be charged double. There is a number of delicious sushi offered in the restaurant. So you should visit it. The Kofukuji temple is the family temple of the Fujiwara, the most powerful clan during the Nara Periods. The temple consisted of about 150 buildings at the height of the family. However, today only two buildings remain which include a five-story pagoda and a three-story pagoda. The overall atmosphere is quite serene and the woods are well-maintained. The temple is close to three other temples, which you can visit free of charge. If you want to eat within budget, visit Shaikaro. The restaurant was made for the Chinese students who came to attend the Nagasaki universities. The main dish of the restaurant is Champon, which is somewhat close to ramen in taste. 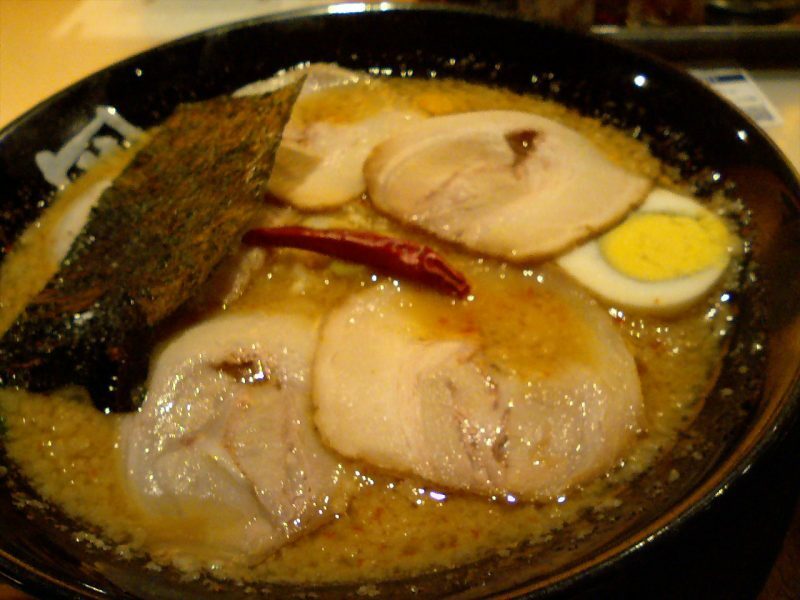 The base is made from chicken and pork, just like ramen. The restaurant service is quick and efficient. So enjoy the experience and visit this restaurant. Opening hour: 11:30 a.m. to 8:00 p.m. The Nagasaki Shipyard museum is a worth-visiting site in Nagasaki. It can be seen from even across the Nagasaki harbor. You will enjoy your visit here because the museum is in the old pattern shop and has a lot of displays. The tour is about 30 minutes, but you can stay longer. The staff is quite friendly. The pine woodwork is quite brilliant. The tour of the museum costs about $109 which is a bit expensive but if you can afford it, you should visit it. 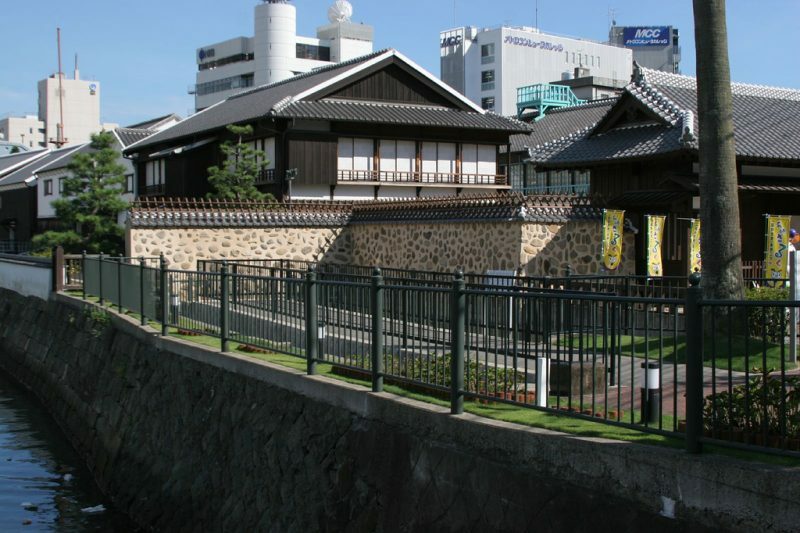 Opening hour: 9:00 a.m. to 4:30 p.m.
You should also visit Unryutei on your trip to Nagasaki. They offer about ten small gyoza for 400 yen, which aren’t steamed. The gyoza is a bit overpriced but quite good to eat. You can also offer beer at the restaurant. The staff is also quite friendly but doesn’t speak English and there is no English menu too. The restaurant is a small walk from the nearby station. So visit it and enjoy the dumplings. Opening hour: 11:00 a.m. to 5:00 p.m.
Minato Koen is a beautiful site in Nagasaki. To say that you will feel like you are in China here isn’t an exaggeration. 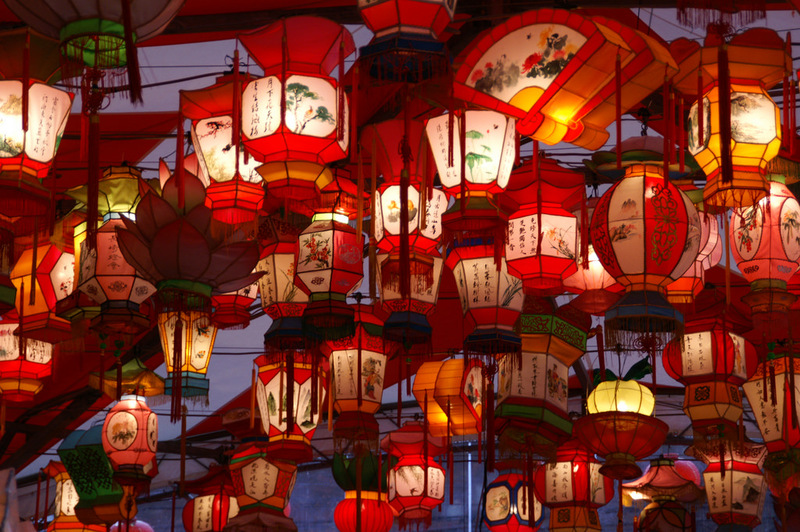 There are a lot of lanterns around which will make you feel as if you are in China, and you will enjoy the 360-degree view. There are a lot of Chinese events on stage, like the dragon dance. 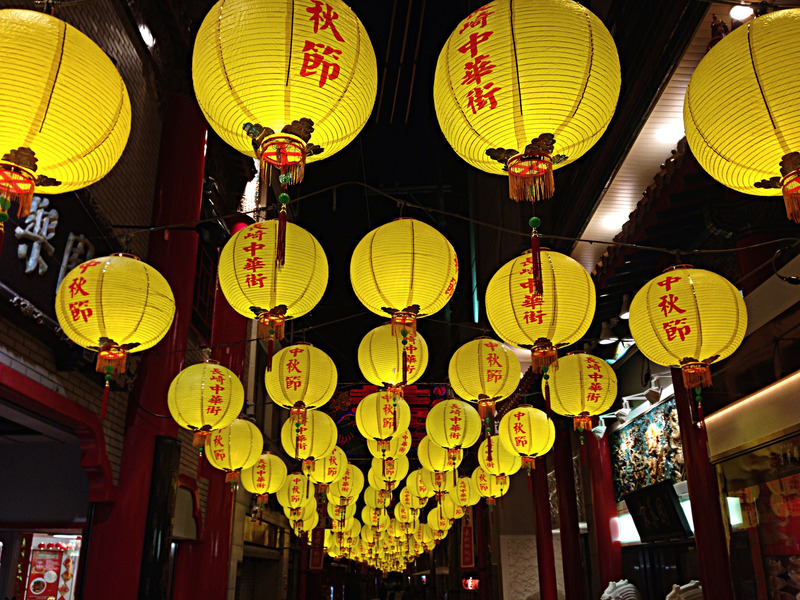 Considering the place is quite close to China town, you should visit it. Kagetsu is a high-class restaurant in Nagasaki which dates back to the 17th century when it was used as a brothel. There is a mix of many foreigner dishes in the restaurant like there is a mix of Japanese Style cuisines with Chinese dishes. The staff is very friendly and speaks both English and Japanese. When you would be finished with the food, you will be full. The food is a bit expensive but it still is a good place to eat. Opening hour: 8:30 a.m. to 10:00 p.m. 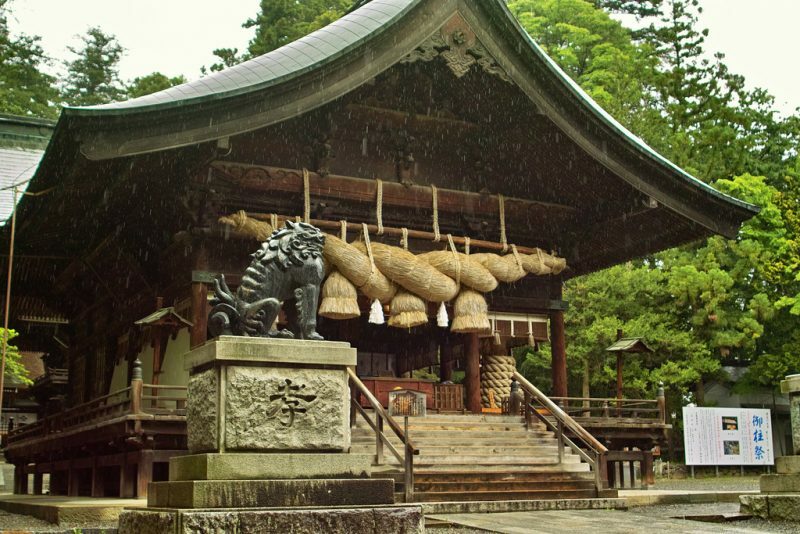 The Shofukuji temple has the honor of being the first zen temple in Japan. 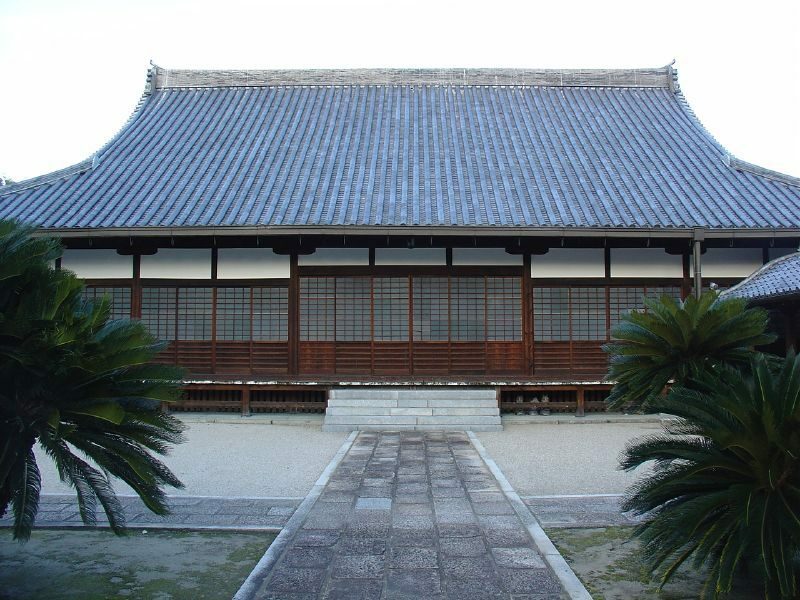 It was founded in 1195 by the priest Eisai who introduced Zen Buddhism from China to Japan. As you walk into the gates of the temple, you would notice that the temple is quite precious as it is well-cleaned. The whole temple atmosphere will make you calm and peaceful. The monks will explain the history of the temple to you. If you are in love with coffee, then visit Jiyutei restaurant located in Nagasaki. The place serves some of the best coffee you will find in the area. All the ingredients in the coffee are mixed quite nicely. You can also order other foods like meat and vegetables. The staff is quite helpful and the menu is both in English and Japanese. The place is a short 10-minute walk from the station. So you should visit it. 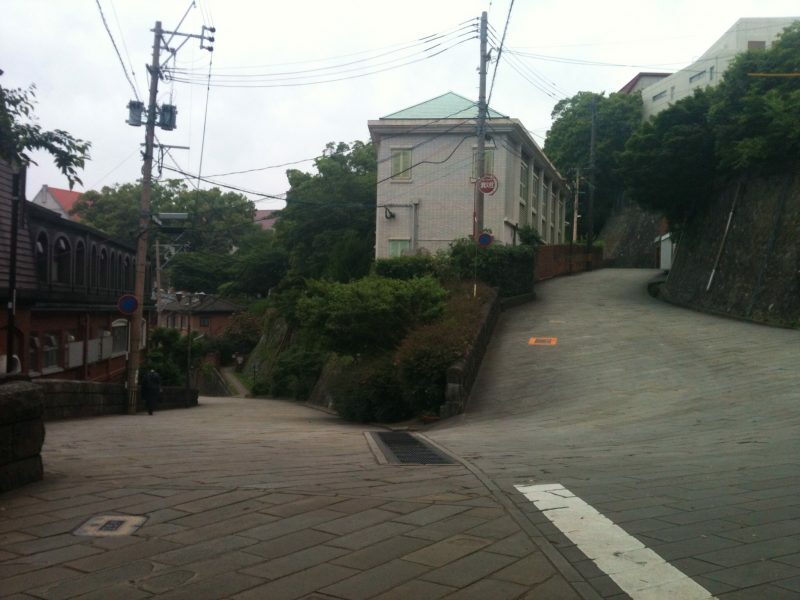 The Dutch slope refers to the steep hill area present in the residential area of Nagasaki. This place has been popular since the merchants resided here since the 19th century. You can freely walk through the streets as you watch the houses of old day traders. The atmosphere is quite nostalgic. If you like walking, it’s a good place. But if you shouldn’t walk here if you have knee problems. Now you know the top things to do in Nagasaki. 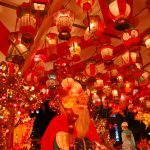 There are tons of things to do in Nagasaki if you have some cash in your pocket and good health. It is popularly said that “you have got to see to believe it”. Nagasaki is one of those places which you got to see to believe. So visit this beautiful place.